I always like seeing different manufacturing facilities. It's interesting to view a factory and try to identify lean production techniques. Not so long ago, I posted a video showing Boeing's 737 moving assembly line. While Boeing's 737 production appears to be a lean success story, they've been building versions of this plane since the 1970's. I should hope they've been able to fine tune the process by now. With the newer launch of the 787 Dreamliner, Boeing fell into cost overruns and major schedule slippages. There's no doubt they use lean assembly techniques, as shown in the truly amazing video, but with an extremely complicated overseas supply chain contributing to their problems, Boeing has been exposed to be considerably non-lean logistically. So how does Lockheed compare? The F-35 has been making headlines due to the high cost and repeated schedule delays. Sounds familiar. How is Lockheed making this plane? Are they using lean production techniques or is this thing glued together by hand? 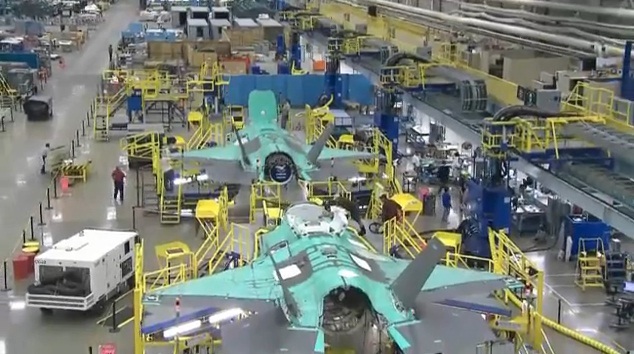 The video below shows a brief overview of F-35 production. While I don't clearly see a moving assembly line like in the Boeing video, the Lockheed goal of one F-35 per day is impossible without it. According to this article, Lockheed will be using a moving production line for a military aircraft for the first time since World War 2. In fact, they cannot meet their goal of one airplane a day without the line moving 51 feet per day. This production rate should be achieved in 2016 or later. Right now, they are still ramping up, with a production rate of 4 per month. Are lean production techniques bringing costs down in the aerospace industry? At a cost of over $200 million each, the F-35 seems to be a hard pill to swallow, but costs are actually in line with other aircraft (Eurofighter). Would it cost more without lean? F-35 Manufacturing from SldInfo.com on Vimeo. Check out my list of free lean videos for more videos like this!